Come for dinner, visit friends, dance to the music, and enjoy the beautiful historic architecture. 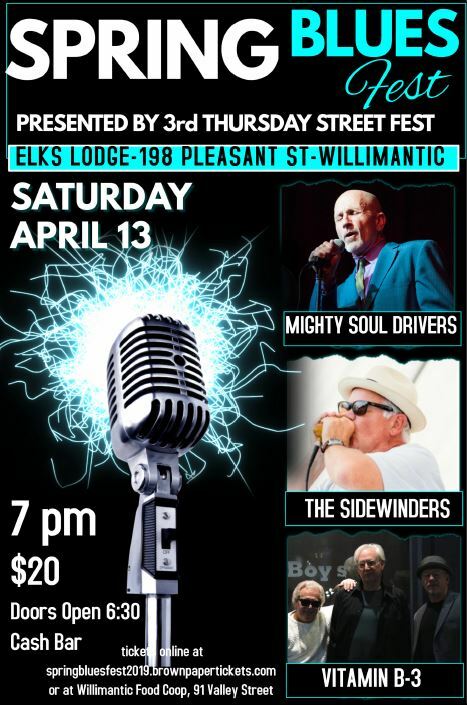 There’s no better way to kill off the doldrums of Winter than Willimantic’s Spring Blues Fest. The Mighty Soul Drivers join forces with The Sidewinders and Vitamin B-3 to help you dance away your Blues with a night chock-full of rockin' Soul dance numbers, down-in-the-alley testifying, and some funky Blues. and enjoy the beautiful architecture. Every 3rd Thursday from May through September, thousands of people from far and wide stroll along Main Street Willimantic amid a background of musical, theatrical, visual and olfactory delights. There are bands and jugglers to entertain you as you meander through the fest. Four stages simultaneously host a wide variety of music and entertainment while over 100 local and regional crafters and vendors showcase the wealth of goods produced in Connecticut. Willimantic's diversity really shines through in the delicious authentic international cuisine. Enjoy locally produced artwork, beer, music, and soda. Free children's activities abound! Thank you to all our volunteers, it can't happen without you. Please be sure to thank our generous Sponsors for their support. Would you like to be a Sponsor or a Friend? Without your help the Fests would not be possible. If you would like to work with the 3rd Thursday Street Fest team as a volunteer or fest helper, please view our Employment page. Buy a button at our Information Booth to support the Fests and to save 20% at the Beer & Wine Garden all season long!